Pork, that's what's for dinner. 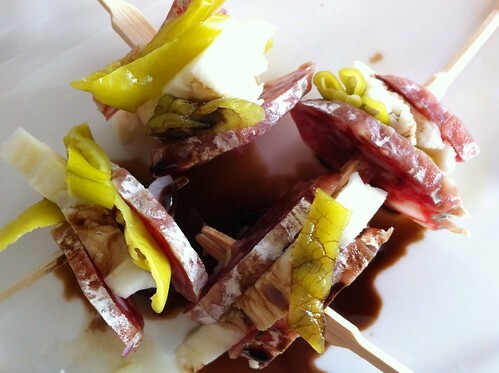 We started with a quick snack of some salumi, with some peppers and fresh mozzarella, drizzled with some olive oil and balsamic vinegar. Quick, simple, and tasty. For dinner, we had thick cut pork chops from Fischers. But what to do when face with don't-want-another-usual-brine for pork chops? add beer. I modified the brine recipe by mixing beer with chicken broth, instead of water, and added some rosemary. 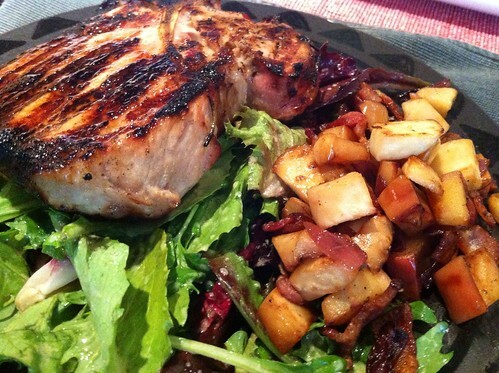 Let me pause and say it was very nice to get the pork chops, via Amazon Fresh on Friday night. I did not have to hassle G to go to the store on Friday evening, or get up early on Saturday. I had intentions of getting some greens, but couldn't find any, so default to a boxed herb salad, dressed with mustard vinaigrette. And we should have more pork. I sauteed some bacon, with apples and a celery root with some red onions. I couldn't taste the difference between the apples and the celery root. But eating the leftover at room temperature a couple of days later, the celery taste was more visible. I will probably not use the celery root again, it added no value. What is not pictured are the potatoes G made. When I gave him the menu, he decided we needed another item. I vetoed corn (which we had last time together), then he suggested potatoes. "N likes potato". I do, a little too. My less-carb plan was foiled. I mentally blocked out the item until the very last minute, when I remember we do not have fixings. The horror. Thank you for bringing sour cream and chives. 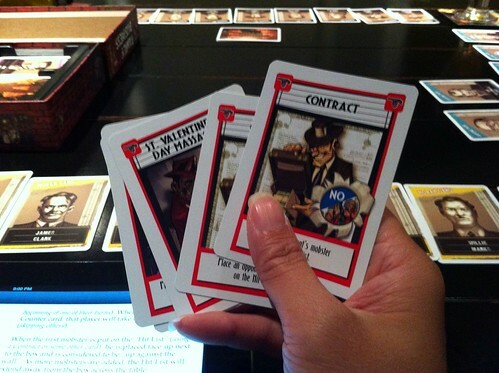 After dinner, we tried a new to us games - Family Business BGG. 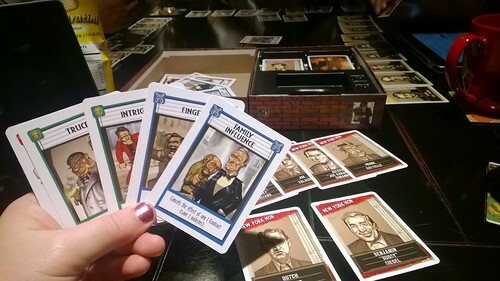 Because of the family and death theme, it reminds me both of Gloom BGG and Guillotine BGG. The object is to be the last one standing. Lots of [killing] contracts, double cross, family influence, etc. Mob members are lined up when a player puts a contract, they may be counter or rescue. Once there are six mob members lined up, mob war starts, and does not end until they are all dead, or peace (card). When there are six mob members left, Mob War is trigger, and the last one standing wins. There was a bit of stare-off-in-space where someone plays a counter card, and it becomes that player's turn. It is like Uno, where Reverse and Skip can be a snoozer, for the other players. For a filler game, I generally like it. I am formulating a .. ahem.. strategy ... if it can be called that ... to be the last one standing. 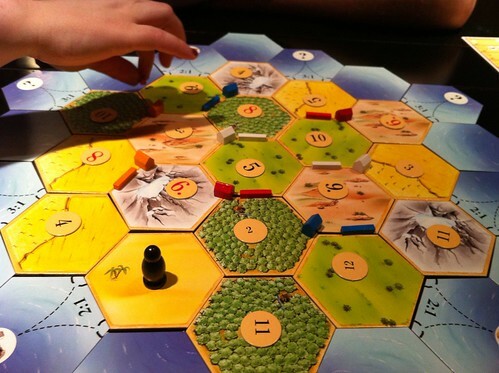 After all the killing, we default to Settlers of Catan, where I had yet another bad placement and lost, spectacularly. 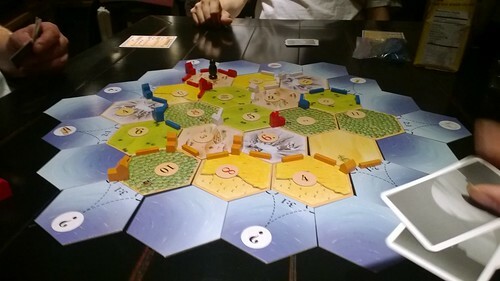 Good thing there were Loacker Quadratini Lemon Wafers, the cookies made losing yet another game of Settlers of Catan bearable. That's a wrap. I hope you enjoyed the evening. See you next time.